LOS ANGELES, CA – October 9, 2006 - Sonnenblick-Eichner Company announced today that it has arranged $28,000,000 of first mortgage financing for the Hotel Andra located in downtown Seattle, Washington. The financing is a 10-year fixed rate loan priced in the low 100 basis point range over the 10-year treasury. The loan, provided by a Wall Street investment bank, is interest only for the first four years and then amortized over a 30-year schedule. The 10-story, 119-room hotel is located adjacent to Seattle’s trendy Belltown, which has become the center of Seattle’s residential activity, art galleries and restaurants. 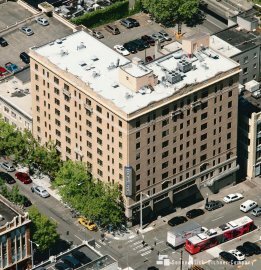 The hotel is within walking distance to Seattle’s financial and retail districts. The property is a member of Small Luxury Hotels of the World and recently completed a $6 million renovation. Sonnenblick-Eichner Company (www.sonneich.com) is a Los Angeles-based real estate investment banking firm that specializes in arranging structured finance for acquisition, construction and permanent loans, interim and mezzanine financing as well as joint venture equity transactions. The company is recognized for its expertise in marketing institutional real estate for sale and providing capital for all product types including retail, office, hospitality, industrial, and multifamily properties.